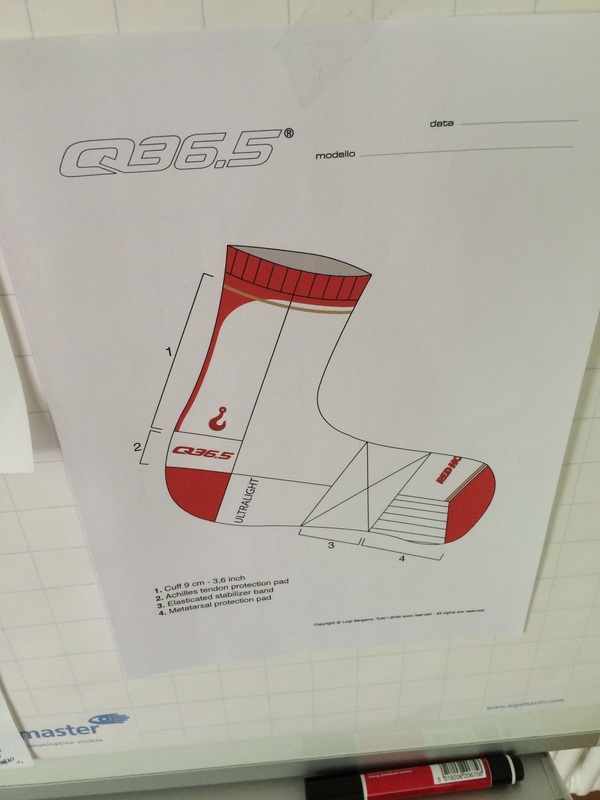 On our rest day at the Giro Delle Dolomiti, we visited Bolzano entrepreneur Luigi Bergamo, the man behind the Q36.5 cycling clothes imported into Japan by David Marx's RGT Enterprises in Nagoya. MOB approaches the Q36.5 HQ (ground floor of building on the left). 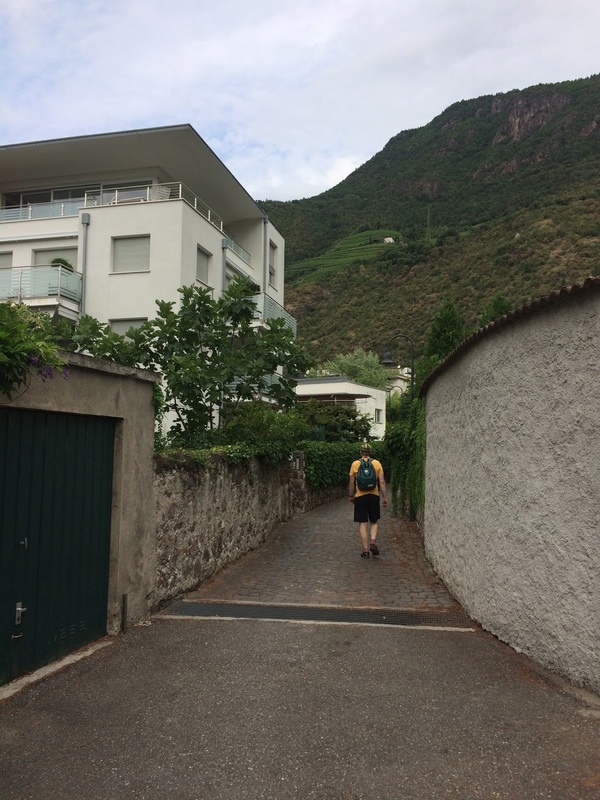 As you can see, Bolzano is surrounded by rather high, steep slopes. 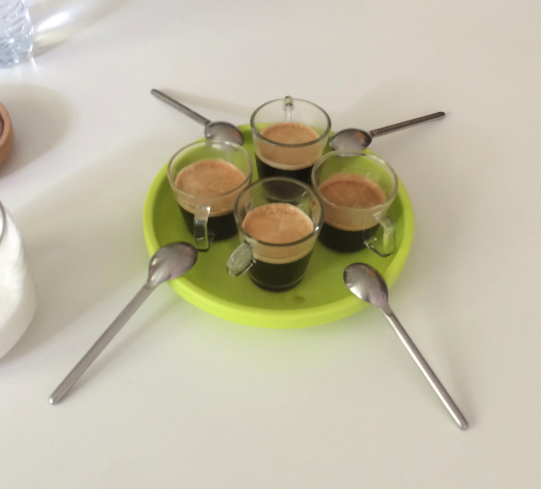 Espresso served for the guests! Mmmm. 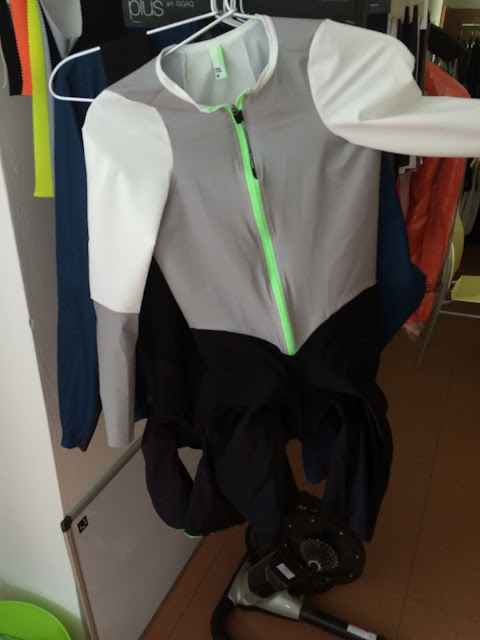 Single piece garment, for the time trialist? of frustration ... when one does something stupid. "Dammit!" or equivalent. Q cap ... with socks behind it. I love my Q thin wool early-winter socks. These are even nicer, with the Italian colors. Q's philosophy. Not for everyone, but for those willing to push the edge just a bit! These clothes are so pretty ... they make a great poster. 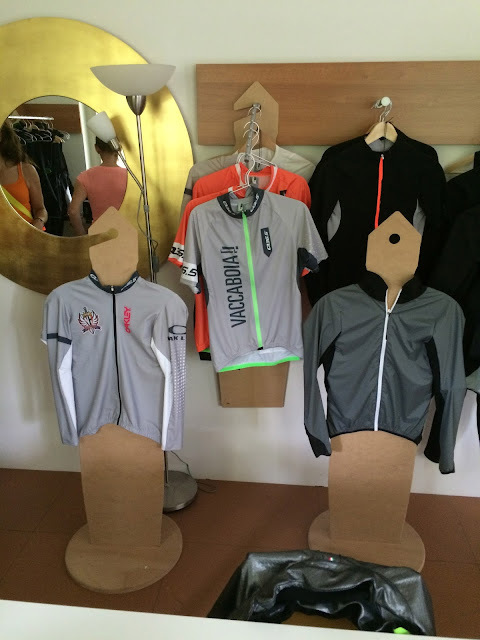 We had a wonderful chat about his inspiration for the brand, looked at lots of great clothes, and some of us returned home with new bib shorts, and a jersey. All four of us were given a pair of socks and a water bottle -- the former being my favorite socks, and the latter nice cycling "swag". 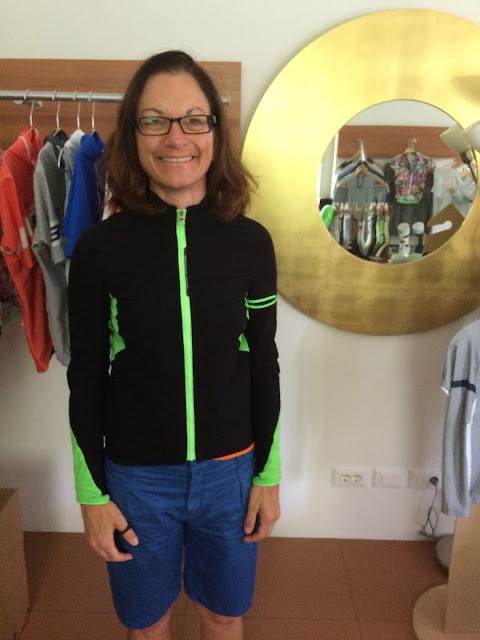 Thank you Luigi for being such a gracious host! 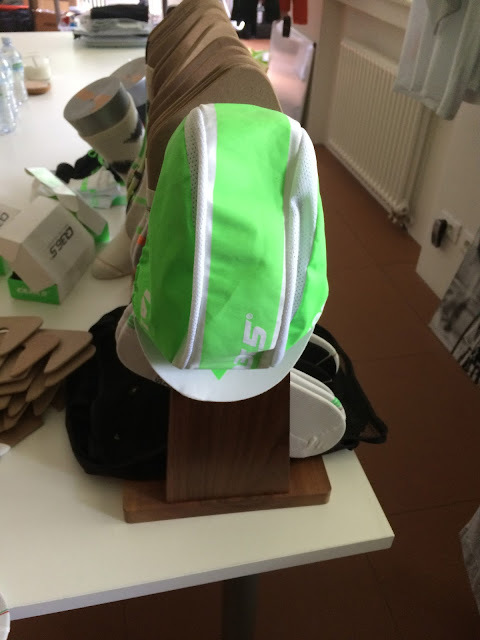 As Luigi explained it, he wants the brand to represent the future of cycling clothes. 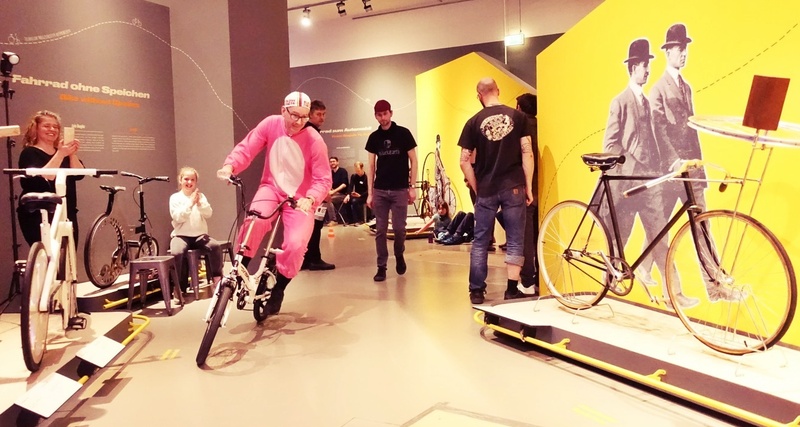 True, he has added some more "democratic" items that stick closer to the present and what we are all accustomed to, but his goal is to be creative and to push the envelope to something better -- clothes that help competitive cyclists achieve their best performances. This is his dream and his inspiration. 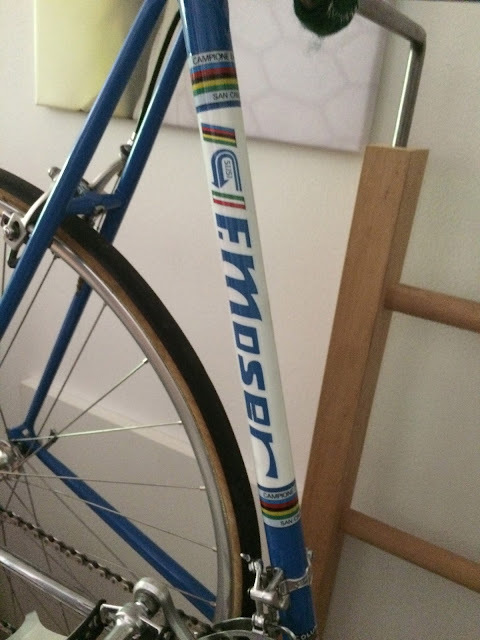 Luigi's beautiful, Eroica-qualified F. Moser racing bike, from his early riding days. Imagine doing climbs in the Dolomites in that gearing! 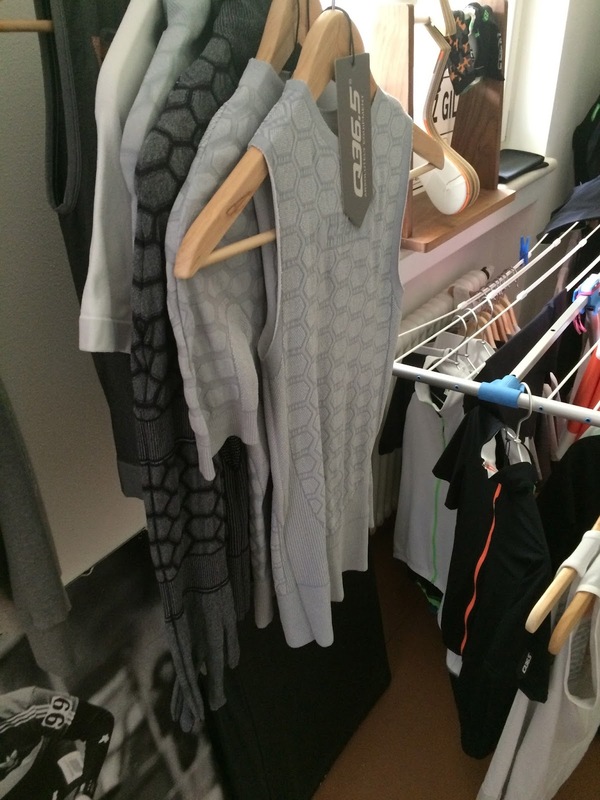 The Q36.5 items I have -- the bib shorts, hybrid Q, long thin winter tights, and now gloves and some other items -- are among my favorites and the best I have ever seen. 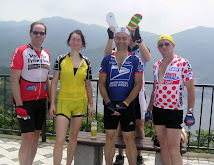 The jerseys, would make me look better if I lost a bit of weight! Thank you, Luigi and Q.